FILE - Japanese Olympic Committee President Tsunekazu Takeda speaks during an interview at his office in Tokyo, Jan. 19, 2018. In the latest blow to the International Olympic Committee's efforts to rid itself of scandal, marketing head Tsunekazu Takeda is being investigated for alleged corruption related to the 2020 Tokyo Olympics. Takeda, who is also the president of the Japanese Olympic Committee, was placed under formal investigation for "active corruption'' on Dec. 10, France's financial crimes office said Friday. Takeda's career in Olympic circles has ticked almost every box, starting with representing Japan in equestrian competition at the 1972 Munich Games and 1976 Montreal Games. As the head of the IOC's marketing commission since 2014, Takeda has overseen the signing of sponsorship deals worth hundreds of millions of dollars, including new partnerships with Alibaba, Intel and Allianz. "The case is causing tremendous concern among the people who are supporting the Tokyo Games, but I will continue to cooperate in the investigation in order to clear any suspicion of me,'' Takeda said. Tokyo Gov. Yuriko Koike told Japan's NHK television she was "very surprised and puzzled'' but declined to speculate how it might affect the Tokyo Olympics. "I just got the initial report on this, so I don't have sufficient information,'' she said. 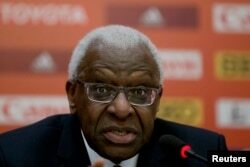 FILE - Lamine Diack speaks during a press conference at the IAAF Congress at the National Convention Center in Beijing, Aug. 20, 2015. "I have explained [to the French authorities] that there was no such illegal activity tantamount to bribery,'' Takeda said. Takeda was leading Tokyo's second straight bid for the Summer Games, after losing in the 2016 Olympics race to Rio de Janeiro. French prosecutors are also investigating Rio officials and IOC members for alleged financial wrongdoing in 2009 linked to Papa Massata Diack. In Takeda's Olympic career, he has led a national Olympic committee, been a vice president of an Olympic sport's governing body (equestrian), a chef de mission for Olympic teams, a sports director for a Winter Olympics (Nagano in 1998), a Summer Games bid leader, an IOC member since 2012, and now chair of one of the most financially significant IOC panels.